Getting your brand's message out there is as easy as downloading our Ukraine email list, handing it over to your sales team, and having them use it to directly connect with locals. We've included valuable, real, human-verified contact information in one organized database. Buy email leads in the country you're trying to reach out to using Bookyourdata.com's localized email lists, which source quality B2B contacts by country. This is one of our pre-made lists and is ready to download right now, allowing your to start calling, emailing, or sending mail to top Ukrainian contacts in minutes. This grab-and-go solution comes in the form of a downloadable .CSV file, which can be plugged right into your CRM software. Just buy our Ukraine business contact list here to get all of the information you'll need. Here, you can get real names of locals in Ukraine, email addresses that have been verified, phone numbers, mailing addresses, company information (such as job titles), and even fax numbers! 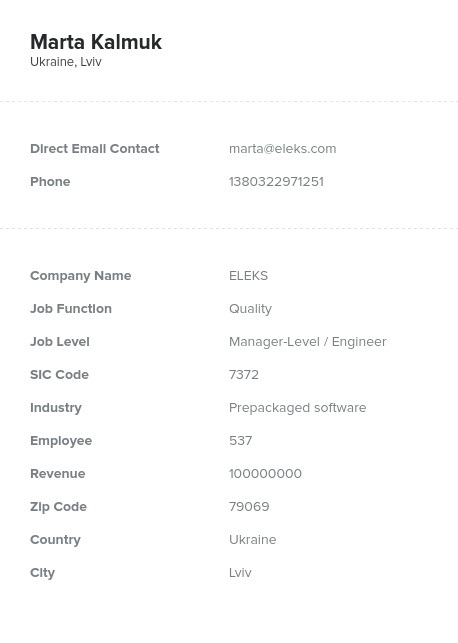 This email database of Ukrainian contacts is the exact tool you need for growing your business in this country, which is important for the European sectors of the agriculture, fuel, mining, manufacturing, and production industries. This is a very important market for all of Europe and has many growth opportunities for many types of businesses. Ukraine is also one of the most populated countries in Europe, meaning that making waves in Kiev, Lviv, or Kharkiv can ripple out to a wide breadth of people. Get our Ukraine mailing list today and form better business relationships!